A Home Owner’s Association or HOA is an organization in a subdivision, planned community or condominium that makes and enforces rules for the properties within its jurisdiction. The purchase of the property automatically makes the homeowner a member of the HOA and dues are required. When you’re looking for that perfect new home, you may have to make a decision as to whether or not you want to be in a community where there is an HOA. How do you decide? 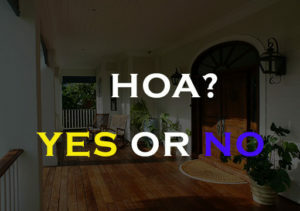 You look at the pros and cons of buying within an HOA community by weighing the pros and the cons on how they apply to you.